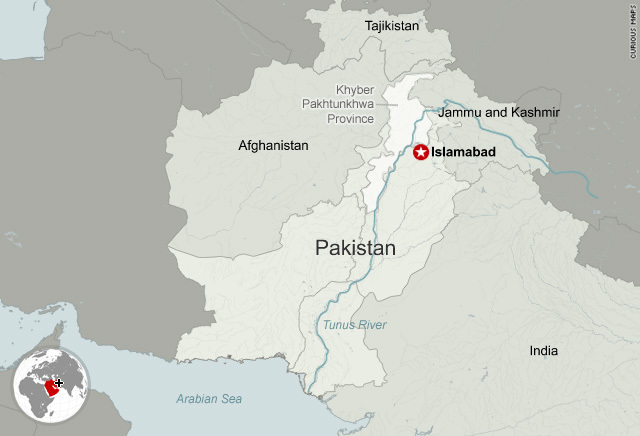 (CNN) -- As the relief effort in flood-hit Pakistan intensified Monday, officials were bracing themselves for an outbreak of disease among the millions affected by the country's worst deluge in 80 years. Rushing floodwaters and mudslides triggered by monsoon rains have engulfed large swathes of northwestern Pakistan since Thursday, killing an estimated 1,500 people said Information Minister Mian Ifthikar Hussain on Monday. Now government officials are concerned a lack of drinking water is spreading conditions such as cholera and gastroenteritis in affected areas such as the Swat Valley in Khyber-Pakhtoonkhwa Province, Agence France-Presse reported. "We estimate that about 100,000 people, mostly children, have been hit by cholera and gastro diseases," Syed Zahir Ali Shah, health minister for Khyber-Pakhtoonkhwa, was quoted by AFP as saying. "Our priority is to first evacuate them to safe areas and then provide them with medical treatment," he added. But the rescue and recovery efforts could become more complicated as monsoon rains continued to fall across much of Pakistan Monday. "Anything they get will aggravate an already devastating situation," said Brandon Miller, a meteorologist with CNN International. The Pakistan Meteorological Department said Monday that it expects enhanced monsoon activity for the first two weeks of August. It forecast widespread rain in the next four days in Sindh, Punjab, Kashmir, Khyber-Pakhtoonkhwa, northeast Balochistan and Islamabad. Areas along the Indus River will be badly affected due to extremely high flood conditions, the department has said. Tens of thousands of people remain trapped on rooftops and in higher areas trying to escape rising floodwaters, according to the United Nations. "We've got the government sending boats and helicopters to try to reach people and bring them to safety at the same time as trying to deliver emergency relief," said Nicki Bennett, a senior humanitarian affairs officer for the U.N.
Damaged roads and bridges have made rescuing stranded residents difficult, she said, noting that even a U.N. warehouse where the organization stores food, blankets, soaps and bucks is partially underwater. The Pakistani military, which has deployed dozens of helicopters and boats across the region, said 25 bridges have been destroyed and some 36 miles (58 kilometers) of road washed away in Swat and Shangla districts. Despite these difficulties, senior commanders in the region told reporters that tens of thousands of people had been rescued from Shangla, Peshawar, Nowshera and Charsadda. In the hardest-hit province, Khyber-Pakhtoonkhwa, authorities estimate that 800 people have died and more than 100 are still missing, the World Health Organization said. "The actual figures could be higher as communication networks in many areas are still disrupted," it said in a report. About 15,000 families in the province need emergency assistance, such as food, clean water, shelter and medical services, the organization said. "As the water level recedes, measures to prevent water-borne diseases will also become a priority," it said. U.N. Secretary-General Ban Ki-moon late Sunday authorized $10 million in emergency aid. This follows an earlier pledge by the United States to send helicopters, boats, pre-fabricated bridges and water-filtration units. The European Union and China have also committed to provide humanitarian aid. A Pakistani Red Crescent official told CNN that the number of people affected by the floods has risen to nearly 2.5 million people, with infrastructure receiving major damage. Rushing water also has washed away thousands of acres of crops, government buildings, businesses, schools, bridges and homes, officials said. CNN's Reza Sayah, Nazneen Akbari and Matiullah Mati contributed to this report.